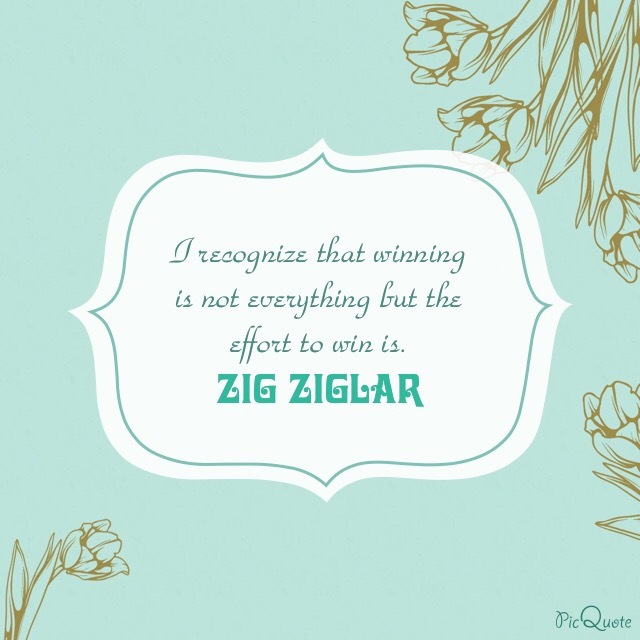 I recognize that winning is not everything but the effort to win is. I can’t take credit for finding this quote. It actually came from Brook Noel’s “Good Morning” affirmations. For those not familiar, Brook Noel has this awesome organizational program called Make Today Matter. In one of those “Good Mornings” it had this quote along with the affirmation: I exercise my power and choice to live my dreams. Great affirmation. Love it. But mind kept replaying the quote. I guess it’s because we always hear that phrase “well, winning isn’t everything.” Sometimes I tend to agree with it. Other times I don’t. When I really, really, really wanted to win at [insert whatever it is], it’s hard to agree. When you’re dealt a bad hand, literally and figuratively, or when someone cheats (because we all know it happens from time to time). But what got me are the words that follow that phrase–the effort to win is everything. The effort to win. That changes the perspective for me because isn’t that the real reason why we get upset when we don’t win? It seems the effort we put into the task deserves a win? But when your focus is on the effort, the process, and not the result, or the outcome, it seems to fulfill itself. At least, that’s the way I read it. You did good. You tried. You worked hard at it. And that should be what matters in the grand scheme of things. If you strive to do the best, you’re doing the best. As an aside, this Good Morning really was a good one. Brook notes Zig Ziglar’s whole quote which mentions how women gives birth to boys and/or girls and not doctors, lawyers, etc. yet when you read obituaries doctors, lawyers, etc. dies so somewhere between being born and dying we choose how to live. Very awesome food for thought.